MainBlogsFundamentally FreundTake Back the Temple Mount! Take Back the Temple Mount! 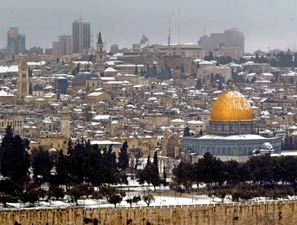 Today is Yom Yerushalayim – Jerusalem Day – the anniversary on the Hebrew calendar of Israel’s liberation of the Holy City during the 1967 Six-Day War. And today, of all days, the country received a potent reminder regarding the intolerance and bigotry being fostered by ascendant Palestinian nationalism and Islamic fundamentalism. When a small group of Jews ascended the Temple Mount this morning to visit Judaism’s holiest site, they were set upon by a group of Palestinians, who emerged from the gold-roofed Dome of the Rock and attacked them with stones, slightly injuring two of them. The police were forced to step in and restore calm, but only after resorting to the use of stun grenades to quell the attackers. The Temple Mount, of course, is effectively under the control of the Muslim Wakf, which is an arm of the Palestinian Authority. And so, while Israel is sovereign over the area, in practice the government allows the Palestinians to dictate what happens on the site of the ancient Temples of Jerusalem. This is not only an affront to Jewish history – but as the attack today demonstrated, it is also an outrageous and absurd situation, in which Jews can not safely visit our holiest of sites. The world media will undoubtedly distort today’s incident beyond recognition – but the key point to bear in mind is this: why is it that Palestinians feel they can riot because Jews visit a holy place? And, more importantly, why does Israel tolerate such a situation?